Batteries in music gear are always trouble. 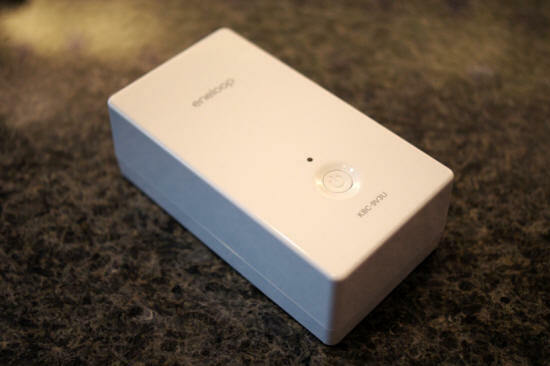 Meet the SANYO Pedal Juice battery eliminator: Your days of bad batteries could be over for good. But is this thing really as good as they say? Sanyo KBC-9V3U-S or something to quieten you down in a good way! 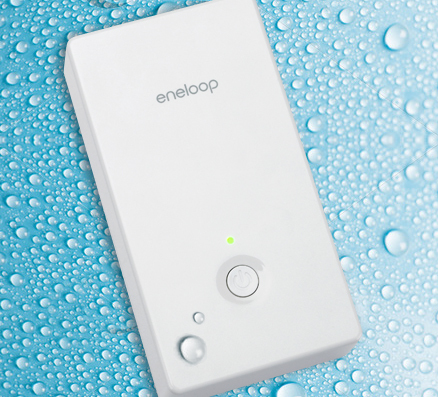 Update: The Eneloop unit also comes in a nice shiny black as shown down the page - just in case you don't like the 'Apple' look. It was a little glaring in the floor pedal thingy! You know the feeling, we have all been there. You get to the gig, set up the amp and other stuff; find those darned pedals that you love so much, plug them in and NOTHING! oops you forgot to change the batteries and you have no spares? That's just one scenario and another one (which I have also suffered from) is when you have bought that 'battery eliminator' that you plug in the wall (hey where's the power on the stage) and you get set up nicely, plug in, turn it on and there's a really great noise! No not the one you expected, but that awful mains hum that we have all had at gigs because the mains power is shot either with ground loops or other nasties that were waiting just for you it seems. Lastly, I have had this problem in the studio too. I have used so many of those 'eliminators' I have lost count. From the most expensive to the lowest cost and everything in between. I even had one of the top brands fail at about 14 months of not that high usage and no warranty left. So I tried lower cost units and you know what, they were similar in some cases and awful in others. That mains hum and ripple persisted no matter what I did and you could hear it all coming through. And when I'm recording pro quality stuff I really don't want that hum coming from external pedals to get in to my sounds. And neither do you; you are your sounds! That's all you have to offer in reality so why compromise your sound with equipment that simply does not hack it? Well, those boys at Sanyo have been thinking about that problem (along with other issues that 'battery eliminators' have). They looked at the latest battery technology (which in fact they are a world leader) and made a nigh on perfect solution for the problem we all get surrounding power to effects pedals. This unit is about the size of a regular pedal so it will fit right in to your effects pedal board without any problems; it's just right for some Velcro to hold it in place. It comes right out of the box with a couple of DC cables and a third to convert the polarity of the output for those more difficult pedals (like the ones I sometimes buy too) and although there is only two outputs on the unit you can of course chain those with the appropriate accessory lead. The mains charger supplied has by default a USA mains outlet connector on it, but I just used a regular 3 pin converter and that worked fine for the UK. When I checked the charger is good for 100-240v AC so I guess its good for you wherever you are in the world unless you're in the Amazon basin or the desert or.. well you get the picture. But its even good there if its charged! Battery technology has moved on in leaps and bounds over the last few years. Check your cell phone and see how long that lasts, even the power hungry ones I could name last for a couple of days. And the main reason is the battery technology. That technology is called 'Lithium Ion' or 'Li-ion' as Sanyo put it. Basically those are batteries that can sustain power for a very long time, they don't typically just run flat either if you don't use them. And the ones in this unit are rather good because they have a sustained output of 9 Volts at TWO AMPS for a long time. You see, this is where its getting exciting. Because if you check out all those mains 'eliminators' that run from the wall outlet many of them are nowhere near 2 Amps output - go on check yourself. This units output is different from all of those type of products. This output provides no hum and that's a fact. 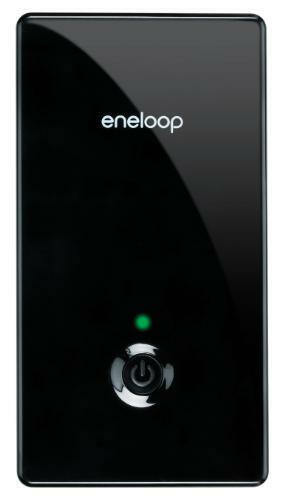 Sanyo also use a technology called 'eneloop'. This Sanyo battery technology will allow the battery in this unit after one year of sitting on the shelf an 85% remaining charge which is near double regular rechargeable batteries. There's no memory effect either. Yet another feature is that this unit is water and shock resistant! I know everyone has heard that one before (ouch). But really, this thing is. In fact they have a Japanese standard that the unit complies with and Japan has very high standards. Color Time How much Power Left? But remember that was SIX pedals turned on for the whole time all running flat out! Bearing this in mind it's very likely that in the real world you will easily get over 20-25 hours even with this number of pedals because yours will not be all on all of the time. And if you have less pedals or more analogue pedals rather than some of the digital stuff I was using then you are on to a winner, I think maybe this will work even longer. Sanyo say up to 50 hours! My results may not be your results though, you might use different pedals; but as a guide it's easy to see just how great this unit was. Actually I was very surprised. Bear in mind when that red light appears you still have lots of time to spare; check the specifications below. One thing I also liked about this unit was that I could easily turn all the pedals on and off with just one button press, nice. But the sound... oh the sound... well that was nigh on perfect. There was no hum (other than what you would usually get from the equipment) this 'pedal juice' thing does exactly what it says on the tin and that makes a real change. I could not tell that this unit was in circuit any more than if I was using the internal batteries on the effects. Now that's something I've been looking for a long time and never found until now. Here in my studio I want quiet! I don't want to start having to use eq or other filters further down the line and while I also use outboard from the desk, there is always a limit to that whether money, expensive external effects processors, or any of another thousand reasons. With this 'juicer' it's rock n roll all the way. As you will see in the video I did record some of the noise with the Pedal Juice in circuit with pedals going in to the amplifier and also just the amplifier with approxemately similar noise levels. Here I demonstrate the noise reduction and you can see up to SIX pedals which basically torture the Pedal Juice for hours on end - awesome in it's own right. I did at one stage try and compare to a well known mains eliminator that I have in the studio - but theirs stopped working - how sad is that! Analog effects unit (Distortion, Overdrive, etc.) - Current used about 10 mA: Approx. 50 hrs. Digital effects unit (Digital Delay, Digital Reverb, etc.) - Current used about 50 mA: Approx. 27 hrs. *1 Standard time to fully recharge the built-in battery when completely exhausted. *2 When using one power port. When using both power ports, a maximum of 1000mA for each port. *3 Usage time may vary depending on connected devices and usage conditions. I liked the switch mode power supply that charges the pedal juice - that was a massive improvement over the one which I was going to use to test against. The other brand had a regular transformer in there and all the electronics in the 'brick'. The 'brick' is now a brick and does not work. I tried hard to find a thing or two bad about this 'Pedal Juice' but really it got to the stage where I was just trying to find something. Now where I come from that's a sign of a good product. This little device for me fixes some of the problems that I have seen for years and I don't know of another product that does this in the way that this Sanyo does. I'm sure that if you have issues with hum from effects pedal power supplies (who doesn't?) then this unit is going to do it for you. I always operate on a trust thing on this website where reviews are concerned. If I think the product is inferior in some way I'll tell it that way, no matter what, but in the case of the 'Pedal Juice' this ones a winner. I rate this at 9 out of 10. If the unit had a tab of Velcro and maybe some of those mains converters for other countries than the USA it could be higher, but the 'only 9V' is also an issue Sanyo should address in future units - then this product would be a world leader above everything else where effects pedals are concerned. Overall a nice unit - go and buy one now. They sell street price for about $150.00 (that's probably going to be about £110.00 in the UK) In the USA you can buy them at Guitar Center and Sam Ash. For USA and UK and the rest of Europe you can find them online. Please note that Amazon UK did not have this unit for sale on their site at the time of review but that might well have changed since the original review. You may well be able to buy this from Guitar Center Cologne in Germany.